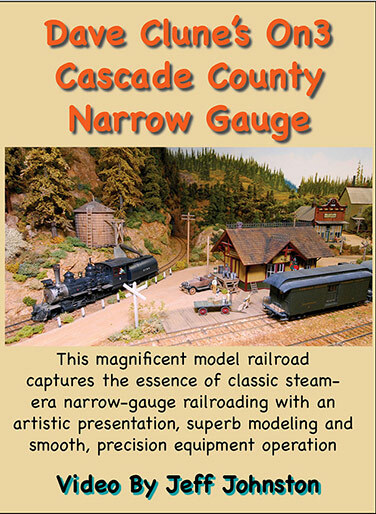 Dave Clune’s late-1920’s era Cascade County Narrow gauge model railroad is an On3 masterpiece known by modelers nationwide. The CCNG features exquisite scenery, a wide variety of scratch built structures, and rolling stock hauled by the kind of smooth-running steam locomotives that make operating on the CCNG a joy. The DVD is organized with three chapters. The first is an extensive interview with Dave in which he discusses the history behind his modeling and prototype inspiration plus the nuts and bolts and artistry of his layout. Next there’s a tour of the railroad with Dave at the throttle of a local freight as he travels across the line and switches industries along the way. The third chapter looks in on a CCNG operating session from start to finish and shows viewers what it’s like to be part of the CCNG crew. Viewers will enjoy a variety of views of the equipment in operation through magnificent scenery and across numerous scratchbuilt trestles and pony truss bridges. Dave’s precise handlaid trackwork helps ensure the railroad operates smoothly, and the Lenz DCC-powered Tsunami-sound-decoder equipped steam locomotives add a new level of interest and fun to the operations. Total run time: The video runs about 85 minutes and both veteran and novice modelers will find something to enjoy. CREDIT CARDS: We accept credit cards or you can pay with your PayPal account by clicking the links below! *US shipping is an extra $3 per DVD ordered. *International shipping is an extra $5.00 per DVD ordered.